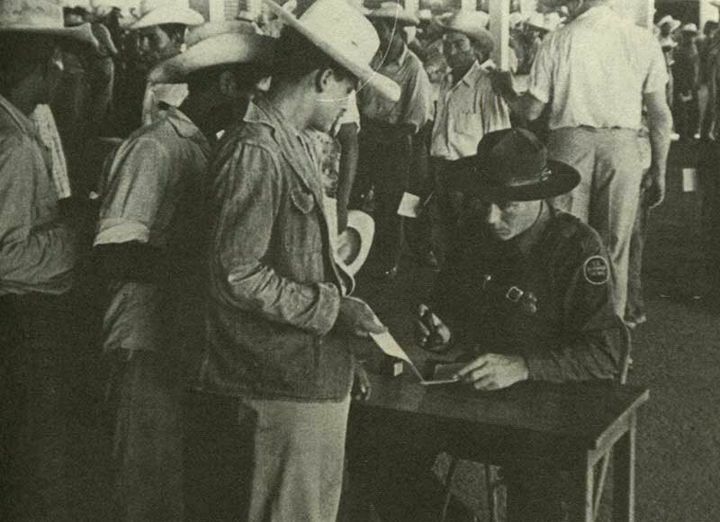 by Tomás F. Summers Sandoval Jr.
Mexican immigrants at border check during 1940s Bracero program. In addition to attracting thousands of new Latinos to the city, the war also changed the community of those already established there. New housing and employment opportunities allowed many families to “get a leg up” during the war. 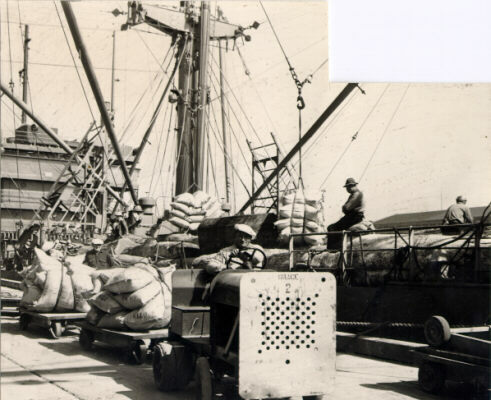 Wagons of coffee are hauled from San Francisco docks, April 20, 1946. By 1950, the Central and South American–born population of San Francisco had risen to 5.6 percent of the total foreign-born. With the Mexican-born population only representing 4.6 percent of the city’s total, the Central American presence was establishing the pattern that would come to characterize succeeding decades. From 1958 to 1960, the flow of migrants from El Salvador alone outpaced that from every other Latin American nation, with more than a third of all Central American immigrants to the city beginning their journey there. (91) Postwar salvadoreños most often came as a consequence of economic desperation and political turmoil. For example, as a nation marked by coffee monoculture, El Salvador relied on trade to export its primary crop as well as to import the majority of the beans, corn, and other foods necessary to feed its population. (92) This would naturally connect the nation to the rest of the world via shipping routes; its coffee connected many of those routes to San Francisco. With a military government in control of a class-stratified and economically unstable society, the El Salvador of the 1950s and 1960s offered little chance for advancement. Migration, whether direct or in stages, presented one solution. 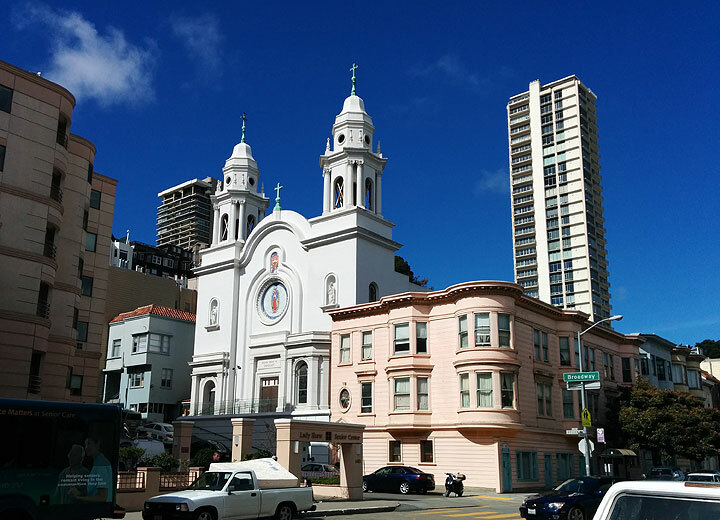 As the San Francisco population of salvadoreños grew, it attracted succeeding waves. When a conservative regime overturned the 1972 election of leftist José Napoleón Duarte and ushered in a renewed period of repression and strife, and when conflicts erupted into civil war nearly a decade later, thousands more used the preestablished networks between Central America and the Bay Area. Since travel by other means would have meant a stopover in a city like San Diego or Los Angeles, this statistic speaks to the use of more direct forms of transport, and the ultimate lure of San Francisco, with its pre-established connections to their homelands. 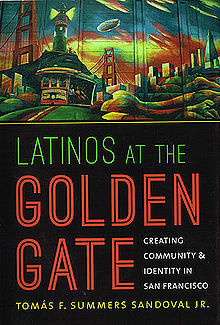 The diversity of San Francisco’s Latino community included representation from most, if not all, Latin American nations. In addition to the six Central American countries and Mexico, Venezuela, Colombia, Ecuador, Peru, Brazil, Paraguay, Uruguay, Chile, Argentina, Cuba, and the Dominican Republic also sent statistically measurable contingents. (99) Puerto Ricans’ migration in the postwar period made them the fourth-largest group in the Latino community. A survey of Puerto Ricans leaving San Juan for San Francisco illuminates the shift in their migration process from the earlier period. The study by Ayuda Católica para Emigrantes Puertorriqueños (Catholic Aid to Puerto Rican Emigrants) sought to provide emigration information to local Catholic parishes. Assuming that the Catholic Church would facilitate these immigrants’ transition into mainland U.S. society, the group conducted research for every major destination in the United States, primarily the East Coast centers of New York, Philadelphia, and Miami. Though made statistically irrelevant by the fact that many migrants failed to answer some questions, the survey does relate vital information for forty-six Puerto Ricans who entered San Francisco between September 1956 and September 1961. (100) The majority of the Puerto Rican migrants questioned left to San Francisco to reunite with a family member or spouse. While twelve of them responded that they had never been to the U.S. mainland, most had previously lived there for at least one year. (101) Though family networks and familiarity with San Francisco seemed instrumental in creating the flow of migrants from the island to the bay, just under half of them also had jobs waiting for them upon arrival. (102) As the small sample suggests, Puerto Ricans came to San Francisco in the postwar period for many of the same reasons as other Latin American migrants. Using established familial patterns and networks, migrants made San Francisco their destination in order to be with family, find work, or just begin a new life. 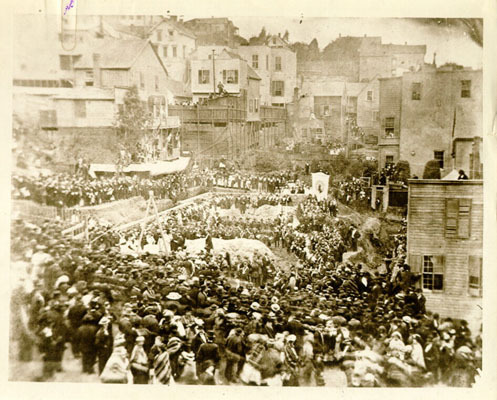 Nuestra Señora Guadalupe Church construction site, surrounded by Latino residents during ceremony early 20th century. 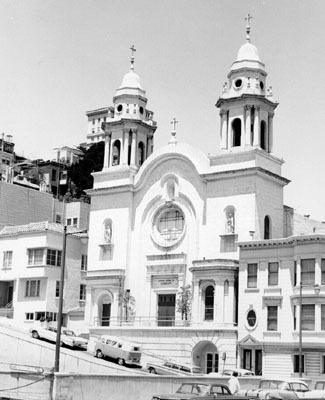 Guadalupe Church in 1964, after the building of the Broadway Tunnel had severed the old Latino neighborhood, and contributed to a major migration from North Beach to the Mission. These trends, presaging more of the same in later decades, made the city an increasingly difficult place for a working-class family to survive, and yet they did little to curb the postwar migration boom. Notes 77. For historical accounts of the roots, process, and effects of the labor systems affecting Mexican migrant workers, see Hernández (2010); and Gilbert G. González (2006). 83. Frank J. Palomares, “Preliminary Report, January 1919,” California Commission of Immigration and Housing, Department of Industrial Relations, Division of Immigration and Housing Records, 1912–39, folder 24, BANC. 84. Dorinda Moreno, interview with author, March 6, 2002, Concord, CA. 88. Rios interview. In a city that still functioned with a high degree of social segregation, the housing at Hunter’s Point may have created some of the first large-scale diverse communities. 90. Martin del Campo, interview with Marilyn P. Davis, n.d., San Francisco, in Davis, 272–74, 276. 91. Figures compiled by International Institute, 1961, quoted in Stirling, 14. Out of a total of 2,481 immigrants to the city, coming from the six Central American nations of El Salvador, Nicaragua, Mexico, Costa Rica, Guatemala, Panama, and Honduras, 834 were Salvadoran. 95. Ibid., 6. A majority of the interview subjects who form the sample of this study arrived in San Francisco by air. 98. Strong cultural rivalries exist between Nicaraguans and Mexicans, a reflection of which may possibly be observed in this tale of migration. See below. 99. U.S. Census charts for 1960, in Stirling, 1. 100. Files of Ayuda Católica para Emigrantes Puertorriqueños, Puerto Rican Migrants file, AASF. 101. Ibid. It should be noted that nine respondents failed to answer the question. 107. U.S. Bureau of the Census (1973). 108. Directory of Large Manufacturers, 1967–68, San Francisco. For the purposes of discussion, the data in the directory was compiled by author. A spreadsheet was made listing all 98 of the manufacturers that listed 500 or more employees. Included were their addresses, principle industry, and head executive. 109. Josephine Petrini interview, in Camplis. Slaughterhouses were located primarily along 3rd Avenue in the part of town known as “Butchertown.” In addition to Latinos, African Americans represented a major component of their labor force. See Tomás F. Sandoval. 110. Directory of Large Manufacturers. 111. San Francisco Conference on Religion, Race, and Social Concerns, 9. 115. Petrini interview, in Camplis. 119. Interview with Helen Lara Cea, by author, October 10, 2001, Berkeley, CA. 120. Polk’s San Francisco City Directory, 1689. This is further suggested in the community’s collective memory. excerpted from Latinos at the Golden Gate: Creating Community and Identity in San Francisco, by Tomás F. Summers Sandoval Jr., Copyright © 2013 by the University of North Carolina Press. Used by permission of the publisher.